Comrade Chairman, Executive Committee of the International Council and comrades present! Thank you all for offering us, SUCI the revolutionary party of India, the opportunity to place our views at this Second World Congress. I come directly to our topic. Here we sit together to express our fraternal solidarity with people struggling to build up an anti-capitalist and an anti-imperialist movements within the erstwhile Soviet Union. I need not spend many words in reminding you that it was a country that once stood as the beacon of revolutionary movement – anywhere and everywhere in the world. Now we are holding this World Congress to stand by them. One may ask as to how could this first mighty socialist state in the world, a unique development in human history, meet such a tragic end? We must have the answer! We know that the toiling Soviet people under the leadership of their working class will strive again to build up that kind of socialist state. But we must also have an answer as to: why did they have to face the ordeal of seeing their beloved socialist state destroyed and to be rebuilt again. You must all be aware that since the end of World War II, warmonger imperialists, headed by US imperialism, have carried out incessant attacks all over the world, particularly on the Soviet Union, the Socialist camp and against communism. Notwithstanding all of these intrigues and attacks, the Socialist camp existed with all of its glory and might, so long as it was led by able leadership of the great proletarian leader, Comrade Stalin, the worthy successor of Comrade Lenin, the architect off the Great October Revolution. But it was the emergence of modern revisionism in USSR that destroyed the first socialist state in the world from within. Intrigues and attacks of imperialism from outside could find success only when they met with this internal condition that had itself been prepared and brought about the change, which was this capitalist counterrevolution. Revisionism has also brought about disunity in the international communist movement and thus weakened it as well, both ideologically and organizationally. Finally capitalist counterrevolution swept across the countries of the socialist camp, leaving us in front of the big question: how could it have happened? 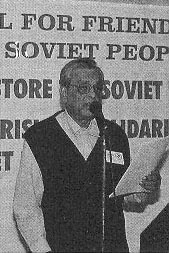 Right in 1956, when Khrushchevite revisionism made its appearance in the 20th Congress of the CPSU and finally usurped power, Comrade Shibdas Ghosh, the founding General Secretary of our party, SUCI, and one of the leading Marxist-Leninist thinkers, raised caution. He said "In the name of fighting the cult of the individual, we are afraid, they (the CPSU leadership) are in reality directing their fight against an individual and not the cult itself. Stalin’s understanding of Leninism is the correct understanding of Marxism-Leninism. This understanding by comrade Stalin has brought the communist movement worldwide to its present stature… to black out Stalin will have the inevitable result of disowning his authority and consequently rejecting the teachings of Lenin …it would mean an open invitation to all sorts of counterrevolutionary ideas to pass off as Marxism-Leninism and the ideological foundation of the communist movement would suffer a setback. In effect it would also uncrown Lenin himself." People of former Soviet Union - even sections of young people - are coming out with fresh hopes and resolves in demonstrations and processions in support of socialism, with banners and portraits of Lenin and Stalin, as it was shown during the observance of the 60th Anniversary of the defeat of Nazism this year. This means that in spite of all efforts by the ruling capitalist class in Russia now and its masters, foreign imperialists, prospects and possibilities of the anti-capitalist struggle are brightening fast in Russia and in other former Soviet republics. However experience in the last years, has now convincingly demonstrated to the Soviets and to the world, that no amount of emotion, nor mere adherence to Marxism-Leninism will help avert the danger of pseudo-democrats, or of the pseudo-communists, revisionists and such others to extend their influence within the movements. Thus it is imperative that in spite of some differences amongst us, we need to build up a united front on the minimum common agreed programme of democratic and anti-imperialist movements on the basis of the dialectical principle of unity-struggle-unity. We must stand united in order to extend our hands of friendship to the Soviet people. The world scenario is tilting towards this end. People of even traditionally powerful and advanced imperialist countries are coming out into the streets to demonstrate. Ground for a united anti-imperialist struggle, with communists at the core to grow and spread over the globe, is being prepared with every passing day. It awaits a correct revolutionary leadership to emerge and take the lead over these struggles. Only such a movement, in tune with struggles for the emancipation of different countries, will lead mankind to real peace and freedom. This remains true for the world as well as for the people of former Soviet Union, as part of worldwide anti-imperialist-capitalist forces. We must fight on truly united to this cherished end! Long Live Friendship with the Soviet People!